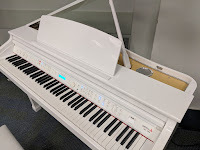 🎹 UPDATED REVIEW - February 1, 2019 - Samick SG500 & SG120 Digital Grand Pianos - Recommended - The Samick company is well known throughout the world for building many fine brand name acoustic and digital pianos for over 50 years. These two new 2018 upgraded Samick digital grand pianos called the SG500 ($5295US store price) and SG120 ($4295US store price) have replaced all previous models and I have played both of these newer models many times and am very impressed with what they can do in their price range. In this detailed review it is important to know that both the smaller cabinet model and the full size cabinet model are identical to each other except for piano size, piano weight, cabinet design, and internal speaker system, and those differences are very noticeable. The functionality. key action, piano sound chip, pedaling, and all other features are identical in both models including have sliding key covers. The Samick pianos are much higher upgraded quality than the cheapy brands you might see in Costco, Guitar Center, etc, so you do get what you pay for. However, these digital grand pianos are significantly less money than the other name brands such as Yamaha & Roland so in that sense I believe the new Samick SG digital grands occupy a unique space in offering some impressive features for quite a bit less than other top brands. The new Samick SG500 mini grand is 4 feet in depth so it is a good size and looks like a slightly smaller version of a real acoustic baby grand piano. Real acoustic baby grand pianos usually measure around 5' is depth so the 4 foot depth measurement of the SG500 (also known as a "mini" baby grand size) is a better size for most people because it can fit in better to more spaces. For those who are "space challenged" in their home, church, school, or other venue, then the SG120 at just 2'8" in depth which is also known as a "micro" baby grand because of its much smaller size, may be a better option for you. But there are some noticeable differences in cabinet design for that model as compared to the SG500. The interior of both models has a wood color/tone sound board with speakers placed into the soundboard at the proper alignment for sound, and then finished off with attractive brass coverings. The wood tone interiors complimented with the brass grills and coverings make these piano look much more elegant than other digital grand pianos I have seen, even at higher prices. The 3 full size support legs under the larger SG500 piano, along with the full size triple pedal lyre, are finished of with brass caster & pedal hardware to match the interior of the piano. I was very impressed that they more closely represent what a real baby grand cabinet really looks like. The SG500 also has a 2 height-position lid (just like real grand pianos) so the lid/top can sit flat or can be raised up in 1/2 position or all the way up in full height position. The SG120 lid has 1 height-position and can be flat or put up into a full height position, although that height is not as high or authentic looking as the SG500. But they are both quite attractive and available in 3 colors which are polished ebony, polished white, and polished red finishes. As compared to the previous models, these 2 new pianos have been totally redesigned in the way they look, the way they operate incl functions and features, their internal speaker systems, the grand piano sound chip, as well as the pedaling and response. But the key action remains the same as in the previous models in large part because it was already so good and a pleasure to play that there was no need for change. Even pro piano players enjoy playing the SG500 key action. All of the piano tones. instruments, and rhythm arranger sounds & styles in the SG500/SG120 are custom designed in Italy by the famous Orla sound & design company which makes these pianos unique among other digital piano brands. The key action is designed and built in Italy by the well known Fatar key action company which has a reputation for producing high quality key actions used in a variety of brands. I enjoyed playing the key action in the SG500/120 because it moves quickly, responds well to dynamics, it's quiet and comfortable, and is the Fatar company's top of the line plastic key action (not wood). Fatar also builds less costly, lower quality key actions with the Fatar label on them, but they don't come close to the more advanced key action inside these new Samick digital grand pianos in my opinion. 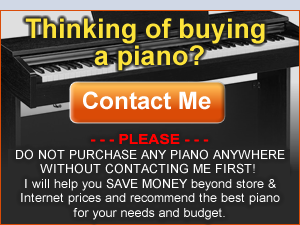 So when it comes down to what these pianos offer, they are custom designed well established, well known Italian digital piano companies who obviously pay attention to detail and it shows in the improved authenticity of the sounds and functions inside these new models, especially as compared to other digital piano brands in this price range ($4000US-$6000US) and as compared to previous Samick models. As far as pedaling goes, I noticed that the pedaling was improved with all 3 pedals being operational and functioning like a regular piano including sustain/damper, sostentuo (middle pedal), and soft (left pedal). The sustain/damper pedal offers more sustain time than in previous models and also triggers half-damper pedaling which gives the player different levels of sustain instead of just on and off as was in the previous models. The pedals are made of brass and look elegant and coordinated with the brass hardware on other parts of the piano. The pedal lyre, which is what they call the triple pedal on a grand piano, looks great and will work fine for most players. There are even better, more upgraded triple pedal lyres on other brands, but you would need to pay quite a bit more money to get that. One of the primary features that everyone wants in a digital grand piano is a realistic acoustic piano sound and these new models have gone beyond the previous models in this way. They now offer 128 notes of polyphony processing memory which is generally more than enough to play almost any piece of music along with the piano sound being more organic and authentic than ever before in Samick digital pianos. It is true that some digital pianos have even more polyphony such as 256-note systems. But the increased polyphony does not necessarily translate to improved performance or sound in other digital pianos. When I played these new Samick pianos (which I have done a number of times) I could definitely tell the difference in the authenticity of sound as compared to other digital grand pianos in this price range and the new SG500 and SG120 did not disappoint. The specifications of the control panel of the SG500/SG120 includes having 10 sound group buttons which offer a total of 362 high quality instrument sounds that have easy, intuitive access to make quick changes to the functions along with separate bass & treble control knobs along with master volume knob, menu buttons and data wheel for easy access to menu functions, transpose & pitch control buttons, high quality reverb & chorus effects along with being able to layer and split any of the 362 instrument sounds. There is even a default "piano button" that automatically resets the SG500/SG120 back to grand piano and shuts off all the other functions, which is very helpful. I must say that after I had a chance to play around with the 362 instrument sounds I was amazed at how good they are. Typically on most digital pianos including some of the top name brands, many of their models with additional instruments sounds are not very realistic at all. The additional sounds such as electric pianos, organs, choirs, brass, woodwinds, strings, etc, are not easy to produce with much authenticity, but Samick has done an excellent job in my opinion and the stereo imaging in some of these sounds are really amazing...it's like you are hearing the real instruments. They even built into the instruments a feature called velocity layering which allows additional new sounds to come in when pressing the keys harder at a greater velocity. An example of this would be playing string symphony sounds and then when you press the keys faster and harder, then brass orchestral instruments come in and then percussion such as timpani comes in, all in one key. It's like having the entire orchestra in just one finger or in multiple fingers. When you play a more complex piano piece then these additional stereo instruments really can compliment the song. It's definitely a lot of fun and can add a lot of playing enjoyment and keep you playing for hours on end:). That's what it did for me when I tried it out. 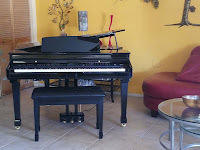 I know that most people want to own a digital grand piano for primarily playing the piano sound, but once you get a taste for what you can do by adding realistic instrument sounds to your music, it will give you a musical experience that you likely have not had before and therefore your musical creativity comes alive in ways you would not have experienced otherwise. Musical creativity and expression is what I teach my students so they become more "musical" along with becoming better pianists. You can have both elements (piano and instruments) and learn to play in a variety of ways beyond just playing the piano. 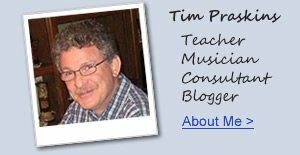 It's great for children, adults, and any student who wants to be a better all around musician. These new Samick digital grand pianos have 350 music style arranger accompaniments in them (which is a lot) and that allows you to sound like a 1-man band just by playing chords. These custom made music styles include drum patterns, bass player patterns, guitar patterns, piano patterns, organ patterns, horn & string section patterns, etc, and have been individually arranged and programmed by the Orla technology design company in Italy and are exclusive the the SG500 and SG120 pianos. Arranger accompaniment styles have been available on a variety of digital pianos and keyboards for many years and some people use them and other people do not. The 1-man band concept is all about helping you to go beyond traditional piano playing and adds accompaniment backgrounds based on you playing left hand chords and right hand melody notes while playing your favorite music styles. Some of those realistic styles include, rock (all types), country, jazz, blues, Latin, waltz, big band, swing, ragtime, and just about any kind of music styles you can think of. The thing that most people don't like about these features is that they generally sound pretty "cheesy" and just not real on most digital pianos. Those cheezy piano accompaniments on those other brands and models sound like some of those cheap $100 keyboards...they sound like toys...but not so on the new Samick digital grands. The leader for a long time in authentic arranger music styles has been Yamaha in their CVP Clavinova digital pianos and Yamaha does produce one smaller 39" deep digital grand piano called the CVP709GP with incredible sounding music styles...but that model costs around $15,000 at Yamaha store discount price and it does it look as good as the new Samick SG500. So with regard to the SG500/120 music styles, they're not quite up to the Yamaha, but they shouldn't be because the Samick models are $10,000 less than the Yamaha but yet still very good with their impressive musicality and authenticity...more so than any other new digital grand piano model under $10,000 that I have played with all these features. The Samick digital grands also have recording features that allow recording and playback of up to 16 MIDI tracks of music (aka: 16 individuals instruments) for people who love to compose and arrange music and are interested in doing more than just 1 or 2 track basic recording and playback. However, for those people who want to record and playback their piano practice or playing sessions with a simple 2-track MIDI recorder (left/right hand piano), the SG500/120 has that type of recording feature as well and it works great for students and serious pianists. Both recording systems are fairly intuitive and easy to use and cover what most people are looking for. Unfortunately the SG500/120 pianos do not offer wav file or MP3 audio recording which some shoppers may want to have. Audio recording is useful when taking the recordings off the piano and playing them back on another device, but most people only want to play back their recordings on the piano and not on an external device, and in that case MIDI recording is more than enough to handle that kind of recording and playback. 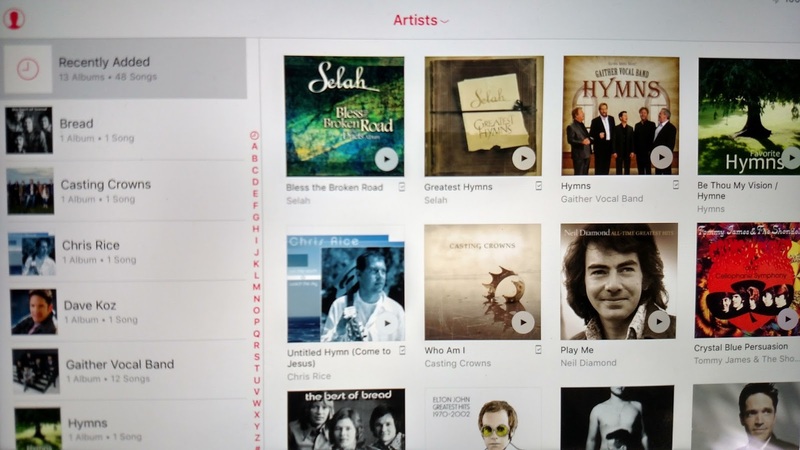 With all of these digital features included in these new Samick digital grand pianos, it's important that those features be easily accessible and intuitive to use. Fortunately on these new models I found that they were noticeably more user-friendly than the previous models and now include a "data wheel" which allows the user to easily zip through the features including the sound, styles, effects, and other functions and be able to see the result in the LCD display screen. The screen itself is not that large but still large enough to provide necessary info to see what you are doing. This data wheel along with control panel buttons allows you to access features quickly and efficiently and combined with control panel "group function" buttons and menu buttons, these things make using the piano more enjoyable and less frustrating than on other pianos out there, including some name brands. The SG500/120 has all the connectivity that most people want including audio outputs, audio inputs, MIDI connectors, USB device input, USB to device output, and microphone input level control. These features allow you to connect other devices into the piano speaker system and take the piano sound and output it to external speaker systems. Speaking of internal speaker systems, the 4' deep size SG500 has an upgraded internal speaker system that is extremely impressive and was a big surprise to me when I heard it. 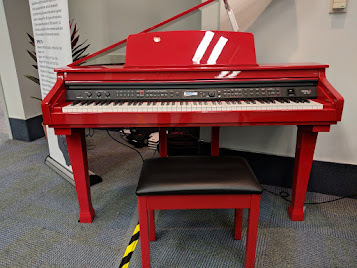 You can have great internal piano sounds and instrument sounds in the instrument, but if the internal speaker system cannot provide high definition quality sound reproduction then those instrument sounds can come out sounding like a toy piano instead of a bold, beautiful sound that everybody wants to hear. To that end the SG500 now has a stereo 160 watt maximum, 8 speaker symphonic speaker system which includes two sub-woofers along with six other strategically placed speakers in the sound board area of the piano. With this new speaker system it was obvious to me that the SG500 was on a completely different level than any other digital grand piano under under $10,000 including the top name brands. 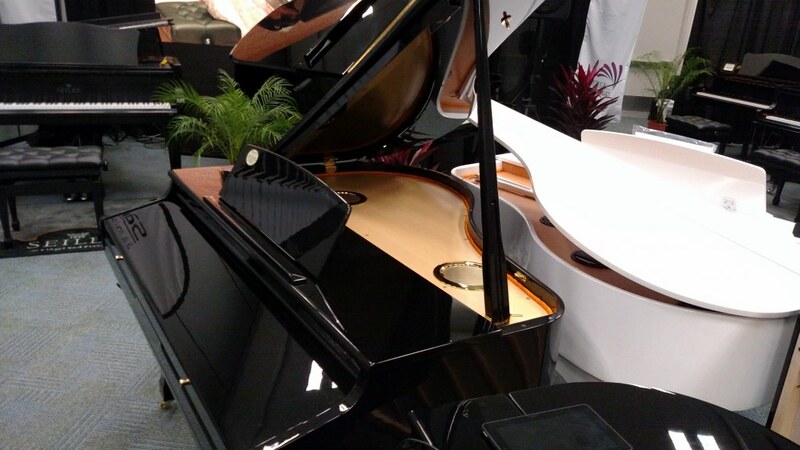 With the new SG500 stereo symphonic speaker system being so good, the factory added a new Bluetooth audio connection which allows external devices such as a tablet or cell phone to play their audio music library (iTunes, etc) directly through the piano speaker system via wireless Bluetooth connection so that your piano now becomes your home music player sound system. 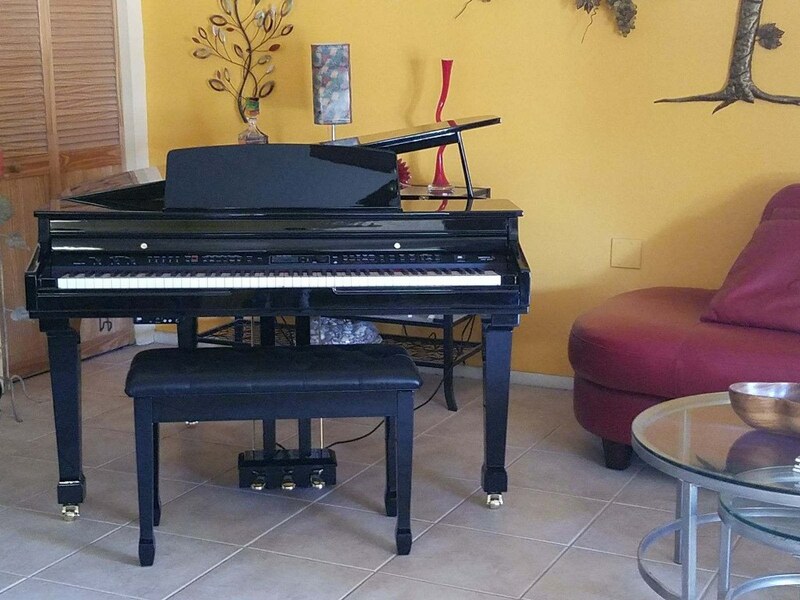 The Bluetooth connectivity can be used to have constant music entertainment playing in your home, school, church, hospital, or event venue from an iPad/iPhone that does not need to be attached to the piano and can have music played through your piano speaker system from another location. Many people do not have a stereo symphonic sound system such as this one designed into the SG500 piano, so having your audio wav or MP3 music playing through the piano is actually very cool and a great way to entertain family and friends. Also, you can play the piano "live" along with the music so that you can interact with it using different instrument sounds in the piano just for fun. 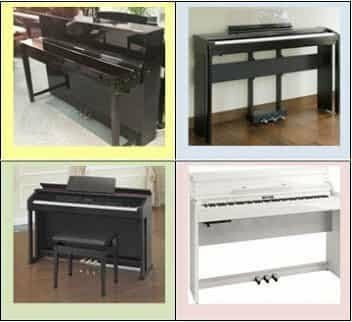 In addition to that, the pianos are capable of playing General MIDI song files of your favorite songs including music lesson songs from the most popular educational curriculum. The MIDI song files can be downloaded from the internet and then played through the piano from a standard USB flash drive. These multitrack General MIDI song files also enable you to slow down the songs to any speed so you can more easily play along with them to learn the song. You can even eliminate the melody line of the song by using a "mute function" while the rest of the song accompaniment tracks continue to play and then you become the melody which can help with learning the rhythm and timing of the song in a more enjoyable way. Definitely more fun than a metronome, although for traditional rhythm & timing lessons the SG500/SG120 does have a variable digital metronome which can be useful for beginners and more traditional players. The smaller 2'8" version SG120 is a great size for someone with limited room space and yet it has all the same digital features and control panel as the SG500 except it has a smaller stereo internal sound system with 60 watts maximum power playing through 4 speakers. The less powerful sound system in the SG120 is surprisingly loud and full for its size (assuming you like a lot of volume) and is matched more closely to the smaller cabinet size of that piano. Like all digital pianos, if you want to play it more quietly you simply turn down the master volume to whatever level you like. But aside from cabinet and speaker system differences which are significant, the smaller SG120 is identical in every way to the larger SG500 including Bluetooth capability. The SG120 has 2 front legs and a pedal lyre acting as the 3rd leg along with the main legs having no casters like its bigger brother the SG500. The lid only has a 1-position height adjustment as opposed to 2 positions on the SG500. The SG120 definitely looks elegant even in its smaller size but it looks big enough to give off the sense that you have a "grand piano appearance" in your room. Also, the key action which is the most important part of any piano is still identical to the SG500. So the SG120 is a good choice if you have a lower budget and smaller space. The bottom line is this...if at all possible I recommend the SG500 over the SG120 if you can fit it into your space and if you have the budget for it. As I mentioned earlier, the SG500 is upgraded in appearance, cabinet and cabinet function, shape, beauty, and its sound performance through its symphonic speaker system. However, the smaller 2'6" size SG120 is still the best playing, best sounding smaller digital piano that I know of in its price range. The SG500 comes with matching padded duet size piano style bench with music storage and the smaller SG120 comes with a smaller single size padded bench. Both models have a 3 year year factory parts & labor warranty which is a good warranty as compared to some other brands.The SG500 is certainly an elegant piece of furniture whether you order one in polished ebony, polished white, or published red. As far as cabinet colors go, although the polished ebony color is by far the most popular, Samick also offers their pianos in an impressive limited edition polished white and polished red finish. Both of these colors are very impressive in my opinion and will certainly make the piano stand out in your home assuming you have the right color mix style for these piano colors to fit in. If you do then I believe you'll be very impressed with them, especially the polished red. In my experience most people might shy away from such a bold color as polished "fire engine" red, but once you see it in person you may change your mind and it will definitely make a "statement" in the room you place it in. The polished white is quite elegant and the control panel is also in white, so the entire front of the piano is perfectly matched. On the red one the control panel is in black so it contrasts nicely with the red cabinet. I think that was a good decision because having the control panel also in red would have been "too much red" in my opinion. With the inside of the piano having the wood-tone soundboard, it really is an attractive combination of color. Normally these kinds of specialty colors cost more in some of the other brands but the SG500 and SG120 pricing is the same for all colors at the moment. They also include a matching color bench at no charge. 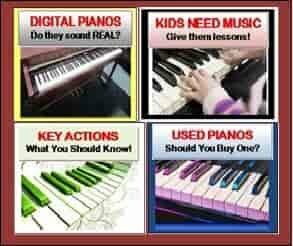 So as you are doing your research for a good digital baby grand or for any new digital piano, please contact us first and we can help save you time and money and help get you the right piano for your needs. 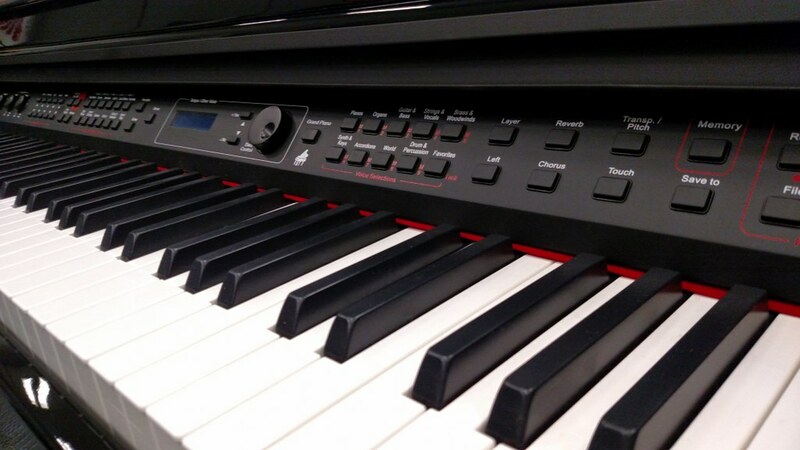 Take a look at the Samick Digital Grand 500 (SG500) video below to hear a few of the things this impressive piano can do. *remember, the SG120 is identical to the SG500 as far as internal functions and features go so everything you hear in this video would be the same on the smaller SG120. The review is about a Samick pianos (South Corean firm) but the video is about Orla Grand 500 (Italian firm). Is there a mistake or what? good question. Those pianos are one in the same. 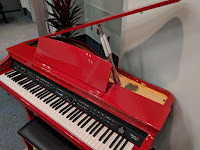 The Italian Orla name (designed in Italy) is used in Europe on the pianos because the Orla people designed the piano sound, instrument sounds, and interactive accompaniments that also are used for Samick SG500/120. Cabinets between the two brands are mostly the same but also may be slightly different.So the videos represent both the Orla and Samick. For what I know, the keyboard of Grand 500 is done in Italy by Fatar - I don't know the rest.